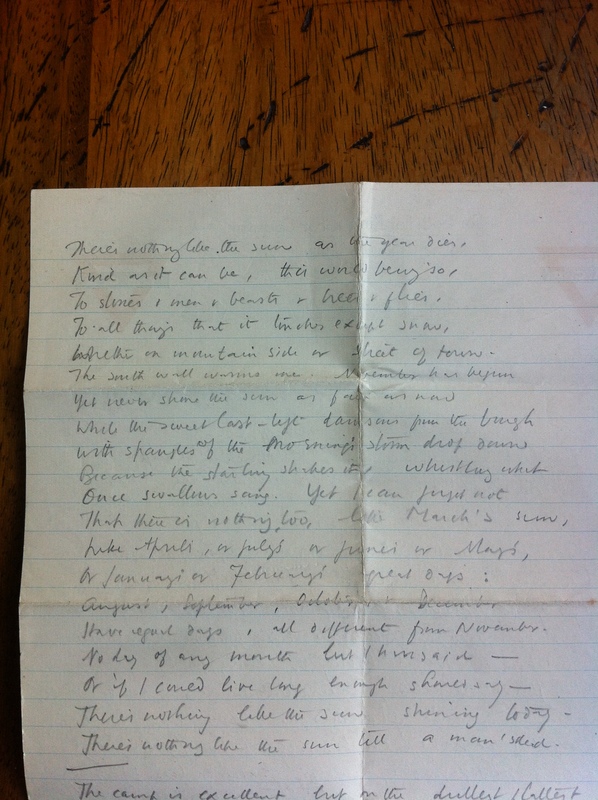 Edward Thomas often did not date his letters, other than writing the day of the week at the top of the page. He is far from the only person to have done this, the Wandsworth archive collections are full of correspondence which is not well dated and for which other information has to be used to establish when it were written. For two letters written to Eleanor Farjeon in late September/early October 1915, one has a postmark which dates it to this week and the other has no clue at all – the envelope has been lost and all that Edward Thomas wrote on it by way of date was “Wednesday”. The letter with the postmark was postmarked Loughton, 9.30pm, 30 September 1915. 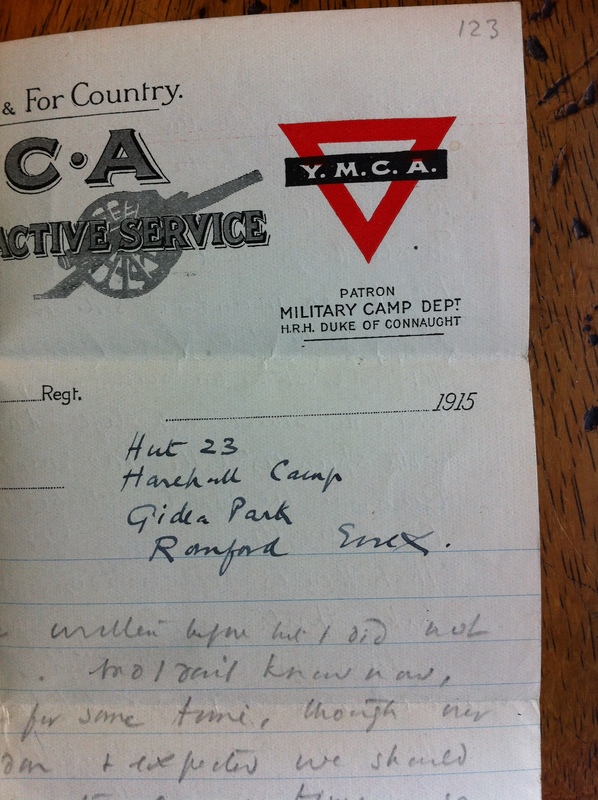 Thomas gives no address, but the later letter was written from Hut 23, Harehall Camp, Gidea Park. Romford South, so it seems reasonable to assume that the earlier letter was as well. Thomas had joined the Artists’ Rifles, more information about them in Harehall Camp can be found here and here, and Havering Museum have photographs of the Camp and local area here. The south wall warms me. November has begun. Have equal days, all different from November. There’s nothing like the sun till a man’s dead. Last week’s blog post mentioned the letter from Edward Thomas to his friend Eleanor Farjeon about coming to London to be attested. 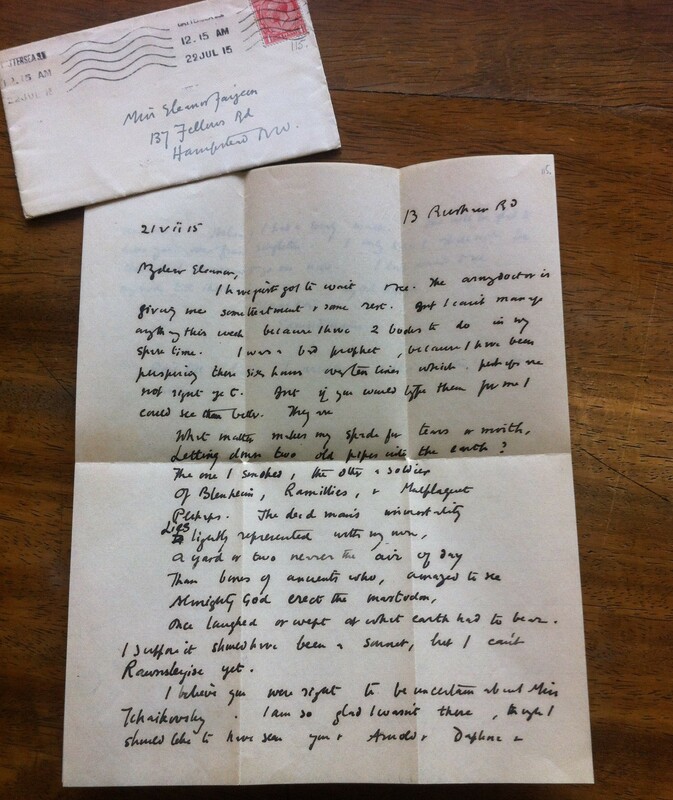 This week’s post looks at the letters he wrote a few days after he joined up, again to Eleanor. Otherwise I should wait longer until I had seen the doctor. I only hope he won’t give me leisure to think why I joined. Several people have asked me; but I could not answer yet. The following day he writes again, also from Balham, having had to be signed off by the doctor until the tendons in his foot had recovered. Letting down two old pipes into the earth? The finished version of the poem can be seen here. Prior to the war Thomas had mainly written criticism, rather than poetry, the outbreak of the war and the influence of his friend Robert Frost meant that he began writing poems in autumn 1914. He often sent drafts or material for typing to Eleanor, getting her to comment on it as well as to type it up – the commentary was a service he provided for her as well. Drafts of his poems within the collection include “Lob” and “Lights Out”, the latter we’ll come to in a future blog. 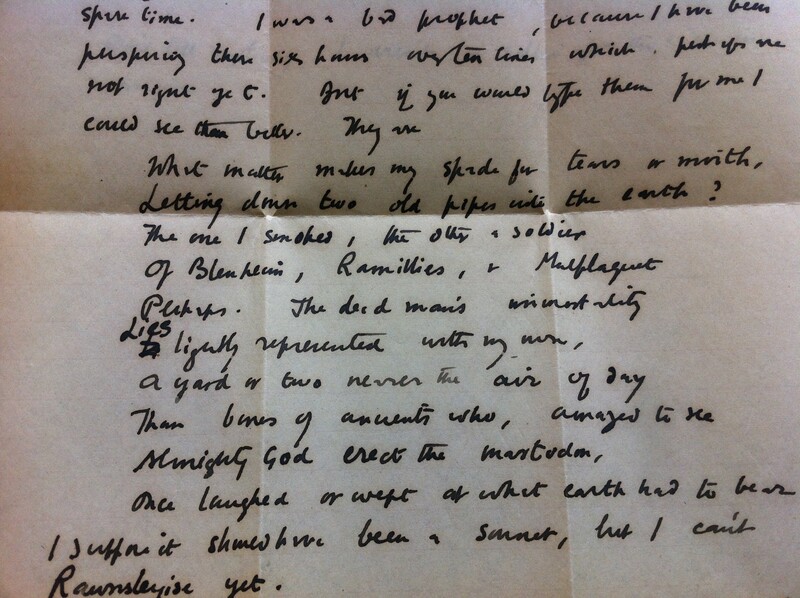 Letters quoted are numbers 114 &115 and available on microfilm in the first instance. The minutes of the Battersea Borough Council meeting of 14 July 1915 do not give much hint of a controversial meeting. Amidst the usual business, four members of staff from the Highways department were given permission to join the Forces (W Franklin, labourer; J Connolly, roadman; R G Vollar, pavior; G W Sinden, labourer), as were W J Kelly, a second class clerk with the Borough Surveyor’s department and J Lee, whose permission came from the Baths and Washhouses Committee but doesn’t record his occupation. There was also a decision not to pay an additional War Bonus requested by the London, Erith and Southall District Allied Engineering Trades Joint Committee. The controversy, well reported by the South Western Star but only hinted at in the minutes, was over the reduction in labour required by the Highways Department. The recommendation was for the Council to approve the road cleansing section going from 142 workmen to 100, pensioning 30 of the men and saving £1784 18s a year (roughly £76,857 in today’s money). Mr Willis stood down as leader of the Progressives on Battersea Council, because they had wanted to refer all the reductions back to the Finance Committee and raise the money to keep the posts by further appealing to the ratepayers. The Star refers to this as a “noble stand”. After much discussion over whether other Committees were also cutting back, and if it was right to cut jobs – with one councillor protesting that it was taking bread out of the mouths of the poor and he could not agree as he was a “trade union leader” – the decision eventually went to a vote. 33 members of the Council voted in favour, and 22 against. This caused uproar in the gallery, with people calling Mr Willis a traitor and a turncoat – although the Star acknowledged that Mr Willis was clearly affected by emotion during the proceedings. Elsewhere the paper reports on the ongoing recruitment drive, saying that there were now 100 men in the Battersea battalion. It also records that Wandsworth had instituted a “corps of lady recruiters… Battersea will go one better, it always does when in competition with Wandsworth. Wait a little while and we shall have a recruiting procession in Battersea that will make Wandsworth despair”. Wandsworth Heritage Service holds Thomas’s letters to Eleanor Farjeon and we’ll be coming back to what he writes about his experiences in future weeks.